Chiaroscuro, in art, is the use of strong contrasts between light and dark, usually bold contrasts affecting a whole composition (Wikipedia). 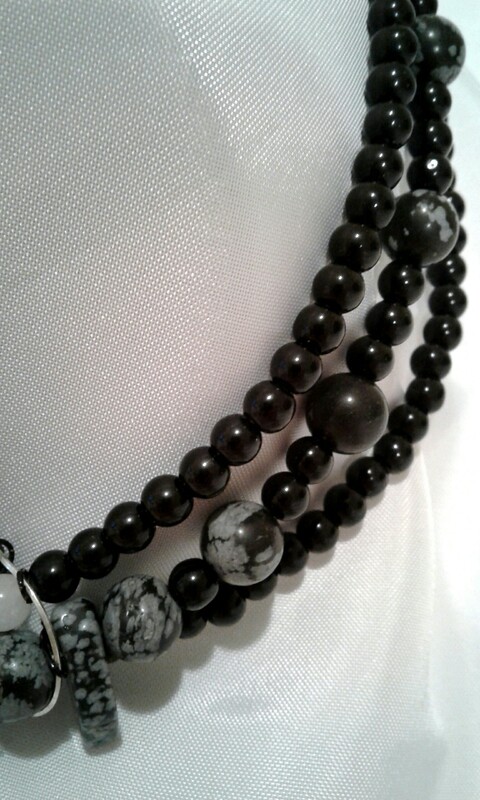 Here the technique is utilized via stones and their energy. Quartz of any type is a very personal magical stone used to develop scrying ability, magical power, and to focus spell casting for increased success as it absorbs, focuses and transmits energy of any sort and, therefore, is used as a ‘generator’ to amplify whatever energy is being worked with. Snow Quartz, which I’ve used here, is a very common variety, often found as pebbles on the sea shore. 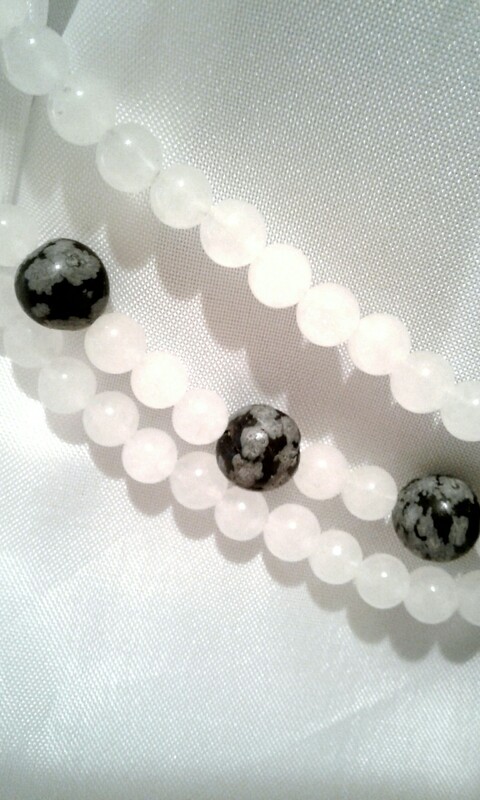 It’s a gentle, feminine stone, and excellent for transmitting healing energy in particular, especially when that healing needed is emotional. Obsidian (famously black, but found in many shades ranging from gray to brown) is actually a hard, dark, glasslike volcanic rock formed by the rapid solidification of lava without crystallization. 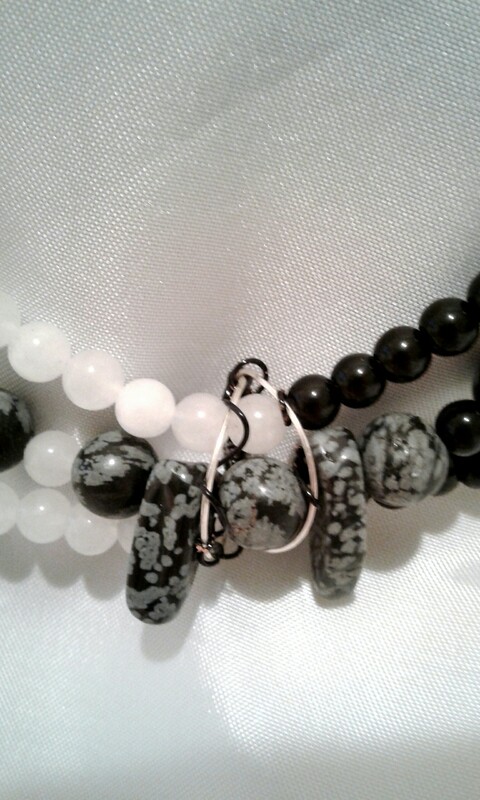 Snowflake Obsidian, featured here, is so called because it’s black basetone is offset with white, snow-like speckles caused by ash settling on the glass as it cools. It’s said to lend great strength to those who are weak and protect the gentle from abuse. This – and all other forms of Obsidian, like the small solid black rounds here – are perhaps best known as excellent stones for drawing Earth energy or helping to ground yourself. They’re especially helpful to people who live in a city or have to endure an unpleasant atmosphere. Used as a mirror in antiquity (and today as well, among those practitioners who can afford it) Obsidian is very protective and can help to reflect negative energy and curses back to the sender, and/or provide psychic protection during times of stress or magical attack. 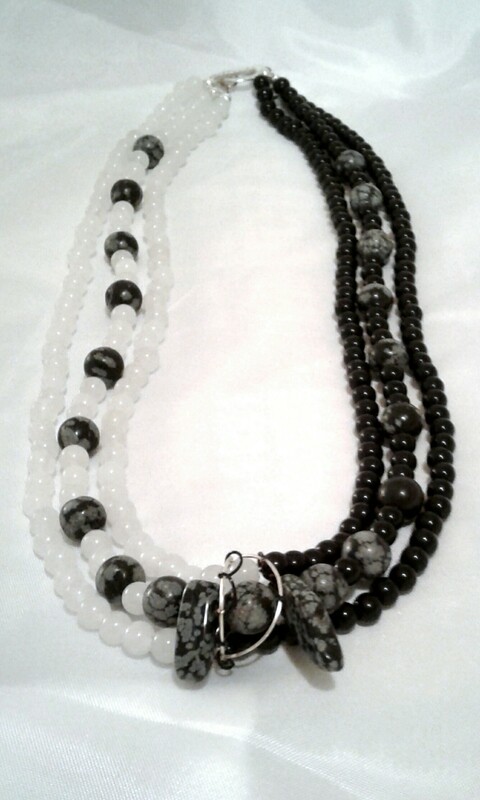 Three strands of light and shadow:7mm Snow Quartz and 6mm Black (interspersed with chunky beads of Snowflake) Obsidian. A Silver plate and Colorcraft wire cage feature adds interest, and invites the addition of a pendant, if you wish. 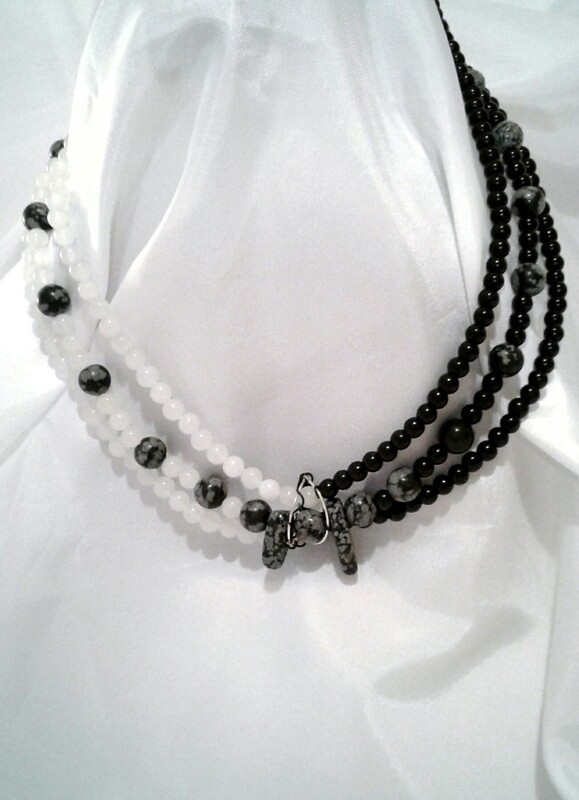 Secured with a silver plated toggle clasp, it’s 20″ long at the neck.